In the Xsheet view, you can identify your drawings as Key, Breakdown or In-between. This helps to keep your Xsheet well organized while animating. When working with several animators, directors, or even other studios, the necessity for retakes will often arise. Harmony also gives you the possibility to mark your new drawings as either Retake Key, Retake Breakdown, or Retake Inbetweens. If your production requires you to mark your drawing with a custom marker, you also have the option to create your own. 1. In the top menu, select Windows > Toolbars > Mark Drawing to display the Mark Drawing toolbar. 2. In the Xsheet view, select the cell you want to identify. This option is not available in the Timeline view. 3. In the Mark Drawing toolbar, press on the Mark as Key Drawing , Mark as Breakdown Drawing or Mark as In-between Drawing buttons. In the Xsheet View menu, you can also select Drawing > Mark Drawing As > Key Drawing, Breakdown Drawing, In-between Drawing, Retake Key, Retake BD and Retake IB. ‣ If you select Mark as Key Drawing, a icon appears in the cell. ‣ If you select Mark as Breakdown Drawing, a icon appears in the cell. ‣ If you select Mark as In-Between Drawing, there is no icon displayed in the cell since it is used to remove a Key or Breakdown marker. You can create your own custom shortcuts for the Drawing Identification options by going in the Preferences panel. Refer to Customizing a Keyboard Shortcut to learn how to customize keyboard shortcuts. Make custom marks for the Xsheet by creating your own icons, then cutting, pasting and changing a bit of code. 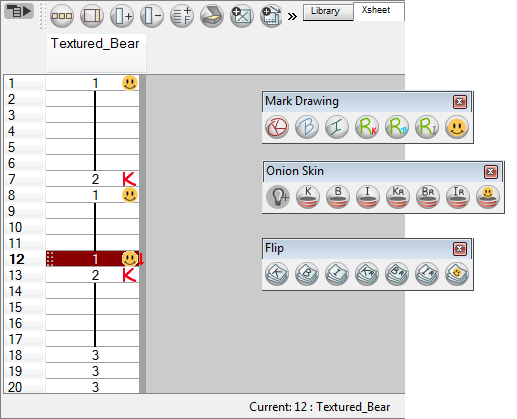 Not only is it possible to have your custom mark appear in the Xsheet and Mark Drawing toolbar, but also in the Onion Skin and Flip toolbars. 4. Paste your icons it the resources/drawingTypes.ddirectory. 5. In that same directory, open the drawingTypes.xml file in a text editor. 6. For each custom icon you want to create, add the following line. Make sure it is placed before the closing </DrawingTypes> tag. ‣ NewButtonName: Write the name of your new marker. This name will appear in the button tooltip. ‣ XsheetIcon.png: Write the name of the icon that you created to appear in the Xsheet column. Include the file extension. ‣ MarkDrawingIcon.png: Write the name of the icon that you created to appear in the Mark Drawing toolbar. Include the file extension. ‣ FlipIcon.png: Write the name of the icon that you created to appear in the Flip toolbar. Include the file extension. ‣ OnionIcon.png: Write the name of the icon that you created to appear in the Onion Skin toolbar. Include the file extension.